June 17, 2016 marked the 10th year of relationship building along the Grand River at Chiefswood National Historic Site, Six Nations. 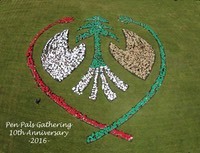 Approximatley 2400 Pen Pals from grades JK to eight from Six Nations, Mississaugas of the New Credit First Nation and many neighbouring communities gathered to celebrate relationship, enjoy some entertainment and to create our largest collective sky art image to date of the Pen Pal logo. Many visitors came out to take in the day and we hope they share the story of relationship building far and wide. We welcome your response to this project. Please consider as you watch what specifically were you drawn to or what stood out for you, or warmed your heart. Where did it take you to in your thoughts? What image or metaphor comes to mind? What does viewing the video suggest about what is possible for the future? What will you take away into your own life from seeing this collective project? Responses can be shared here. The Pen Pal Committee (amazing dedicated teachers, community members and organizations), every single volunteer on our special day (family, friends and dedicated people in our communities), the Ministry of Indigenous Relations and Reconciliation, Indigenous and Northern Affairs Canada, Ontario Power Generation, Indigenous Studies-McMaster University, Enbridge, Dreamcatcher Charitable Foundation, David Ritchie (Drone operator), Six Nations Police, Ontario Provincial Police (Cayuga Detachment), Grand Erie Elementary Teacher’s Federation, Union Gas, Brant Haldimand Norfolk Catholic District School Board, That Crafty Sew and Sew, Caledonia Music Centre, Sharp Bus Lines, Grand River Enterprises, RONA Simcoe, Blue Star Ford Simcoe, Simcoe Composite School, Six Nations Tourism and Six Nations Parks and Recreation. Thanks goes to the performers who shared their amazing talents with us; Q-Mack and J-Box, Saidat, Tribal Vision, Thompson Wilson and Tom Wilson. We were honoured to welcome and host the following special guests; Lieutenant Governor-Honourable Elizabeth Dowdeswell, Minister of Indigenous Relations and Reconciliation-Honourable David Zimmer, Brant MPP-Honourable Dave Levac, Elected Six Nations Council Chief Ava Hill and Arnold Jacobs (creator of the Pen Pal logo design). The Pen Pal Project is supported by Grand Erie District School Board, Haldimand Norfolk REACH, Ganohkwasra, Libro Credit Union (Ralph Luimes) and Six Nations Council. Support and guidance is appreciated from the Haudenosaunee Confederacy Council. Special thanks is extended to students from Kawenni:io Elementary School, J.C. Hill School and Caledonia Centennial Public School for the opening.